For starters, try to keep your showers short and cold, so you can prevent condensation from happening in your bathroom. Once you're done taking your shower, dry your bathroom (its walls, curtains, floor, etc. ), so you can eliminate some of the excess moisture in it. Don't leave your damp clothes and towel on the bathroom floor. Take them out so they can ventilate, dry properly, and not attract any mold growth. Speaking of ventilation, it's necessary that you let air flow through your bathroom. Open windows and doors, and if possible, turn the bathroom fan on to minimize the humidity. Keep the bathroom properly maintained. This means that you should fix any sources of stagnant water (such as a clogged drain, a leaking pipe, or a faulty faucet). 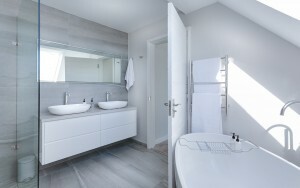 Another tip is to clean the bathroom regularly. Keeping it as clean as possible will guarantee that you'll kill of the mold fungus before it has a chance to grow and spread. Last but not least, get rid of moldy spots early on. If you detect any signs of mold growth, clean them thoroughly with bleach and water, so you can keep them from developing further. If your house requires professional property restoration and mold remediation in Stormville, call Zott Construction DKI at (845) 227-4141 to request a free estimate.